We are a young couple and this is our much-loved home; we think you'll love it too! You'll have the entire flat to yourselves. It's on the top floor of a Victorian house off North End Road in Fulham on a quiet street. Very central area, walking distance to Earl's Court, West Brompton and Fulham Broadway tube stations. 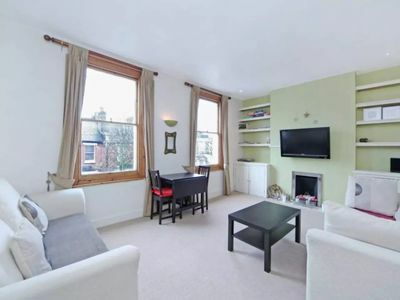 Surrounded by bars, restaurants, pubs and with the green, open spaces of Eel Brook Common and Bishop's Park just a short walk away, the location of this apartment is just ideal! For London standards, the bedroom is large. And we mean it: it's l-a-r-g-e! So is the living area. Both rooms get lots of sunlight. We have remodelled the kitchen and the bathroom recently so they look smart. There is a washer/dryer and a dishwasher (which is hard to come by in London). The bedroom has a queen size bed - very comfortable for 2 people and our cleaners place fresh, hotel quality linen on the bed just before your arrival. The living room has a sleeper sofa which can accommodate two individuals, although it's not super big. There is a large screen LCD TV and wifi will be there from the 20th June too! In case you don't know much about Fulham, it's a safe and handsome neighbourhood located just west of Chelsea. Lots of restaurants, pubs and shops. Its central location was what had drawn us to Fulham in the first place; you can be at Westminster in 20 minutes. Oh, there is a lovely Waitrose supermarket in 5-min walking distance. Best grocery store in the UK! This is our home, our baby with lots of great memories. Come and make yours!